"Nothing is more Western than hatred of the West." So writes the French novelist and essayist Pascal Bruckner in his book La tyrannie de la pénitence (2006), capably translated into English by Steven Rendall and recently published by Princeton University Press as The Tyranny of Guilt: An Essay on Western Masochism. "All of modern thought," he adds, "can be reduced to mechanical denunciations of the West, emphasizing the latter's hypocrisy, violence, and abomination." 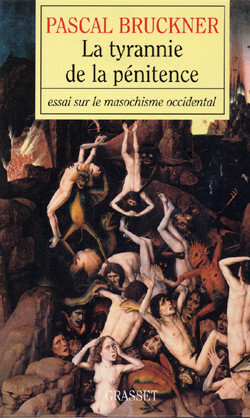 Cover of Pascal Bruckner's "The Tyranny of Guilt: An Essay on Western Masochism." Another way to sum his message: the imperialism of guilt. He exaggerates, but not by much. He shows how Europeans see themselves as "the sick man of the planet" whose pestilence causes every problem in the non-Western world (what he calls the South). When the white man set foot in Asia, Africa, or America, death, chaos, and destruction followed. Europeans feel themselves born with stigmata: "the white man has sown grief and ruin wherever he has gone." His pale skin signals his moral defectiveness. These provocative statements undergird Bruckner's brilliant polemic arguing that European remorse for the sins of imperialism, fascism, and racism have gripped the continent to the point of stifling its creativity, destroying its self-confidence, and depleting its optimism. Bruckner himself concedes Europe's blemishes but he also praises it for self-criticism: "There is no doubt that Europe has given birth to monsters, but at the same time it has given birth to theories that make it possible to understand and destroy these monsters." The continent, he maintains, cannot be just a curse, for its sublime achievements complement its worst atrocities. This he calls "proof of grandeur." Paradoxically, it is Europe's very readiness to acknowledge its faults that prompts self-hatred, for societies that do not engage in such introspection do not lacerate themselves. Europe's strength is thus its weakness. Although the continent has "more or less vanquished its monsters" such as slavery, colonialism, and fascism, it chooses to dwell on the worst of its record. Thus, his book's title, The Tyranny of Guilt. The past, with its violence and aggression, is frozen in time, a burden Europeans expect never to throw off. The South, in contrast, is deemed perpetually innocent. Even as colonialism fades into the past, Europeans righteously blame themselves for the plight of once colonized peoples. Eternal innocence means infantilizing non-Westerners; Europeans flatter themselves as the only adults – itself a form of racism. It also offers a way to preempt criticism. 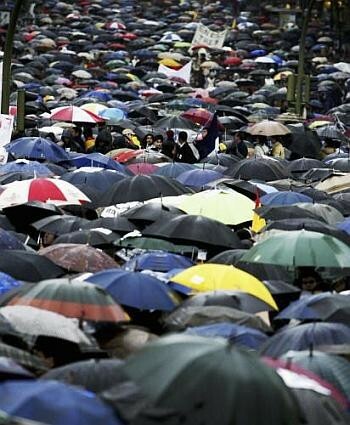 About one million Spaniards protested the terrorist bombings one day after they took place, on March 12, 2004 - by blaming the atrocity on their own prime minister, José María Aznar. This explains why Europeans ask what they "can do for the South rather than asking what the South can do for itself." It also explains why, after the Madrid bombings of 2004, a million Spaniards marched against not the Islamist perpetrators but their own prime minister. And worse: why they saw Spanish civilians "torn apart by steel and fire" as the guilty party. As shown by the Madrid bombing and countless other acts of violence, Muslims tend to have the most hostile attitudes toward the West, and Palestinians rank as the most hostile of Muslims. That Palestinians face off against Jews, the extreme victims of Western murderousness, makes them a perversely ideal vehicle for rebutting Western guilt. Making matters worse, even as Europeans disarm themselves, Jews take up the sword and wield it unashamedly. Europe exonerates itself of crimes against Jews by extolling Palestinians as victims, no matter how viciously they act, and by portraying Israelis as latter-day Nazis, no matter how necessary their self-defense. Thus has the Palestinian question "quietly relegitimated hatred of the Jews." Europeans focus on Israel with such an intensity that one could think the fate of the planet will be determined "in a tiny stretch of land between Tel Aviv, Ramallah, and Gaza." And America? Just as "Europe relieves itself of the crime of the Shoah by blaming Israel, [so] it relieves itself of the sin of colonialism by blaming the United States." Excommunicating its American child permits Europe to preen. For his part, Bruckner rejects this easy out and himself admires American confidence and pride of country. "Whereas America asserts itself, Europe questions itself." He also notes that, in time of need, the wretched of the earth invariably turn to the United States, not the European Union. To him, the United States is "the last great nation in the West." He hopes that Europe and America will cooperate again, for when they do, they "achieve marvelous results." But his own evidence points to the unlikelihood of that prospect. Related Topics: Conservatives & Liberals, History, Views of US | Daniel Pipes receive the latest by email: subscribe to the free mef mailing list This text may be reposted or forwarded so long as it is presented as an integral whole with complete and accurate information provided about its author, date, place of publication, and original URL.